Radio Free Europe/Radio Liberty (RFE/RL) has announced plans to launch news services in Bulgaria and Romania in a bid to strengthen the media landscape in both countries with the hope that their coverage, carried out by local journalists, will help the growth of a free press, promote democratic values and institutions, and inform discussion of their place in NATO, the EU and other Western organizations. RFE/RL stressed in their press release that government officials, civil society representatives and journalists in both countries have expressed concern that disinformation, corruption, and social division are undermining their political systems. The news services in Bulgarian and in Romanian are scheduled to begin in December 2018, providing multi-media reporting and analysis and partnering with local media. RFE/RL already has bureaus in Bosnia-Herzegovina, Kosovo, Macedonia, Montenegro, and Serbia. It also has a Romanian-language service for Moldova. RFE/RL provides news and information to 26 million people in 25 languages and 20 countries where media freedom is restricted, or where a professional press has not fully developed. As a media company it is funded by a grant from the U.S. Congress through the Broadcasting Board of Governors. During the Cold War, RFE/RL broadcast its programs for 53 years to its Bulgarian and for 57 years to its Romanian audiences. 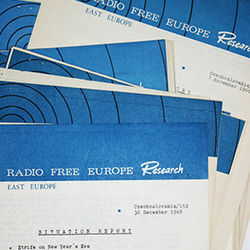 The high quality of the programs was guaranteed by support from RFE/RL Research Institute's unique archival and press collection and library, which is now all accessible for research at Blinken OSA in Budapest. Over 22 000 reports, analyses and studies from the Romanian and Bulgarian collections are also available online through Blinken OSA'S website.